Date change due to Hurricane Sandy. 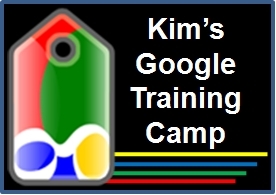 Packed full of Google Goodness, this Google Tools Training Camp will demonstrate the uses of free Google Applications to help in your business. Scroll down to purchase/Members please make sure you are logged in to receive member pricing. WHAT IT INCLUDES: Access to the live sessions to interact and ask questions with Kim. Recordings from each live webinar session (1 hour each). 60 plus page electronic or printable workbook with detailed instructions and screen shots. Plus email support! Limited to the first 20 people! After your purchase you will receive a username and password to a private page that will have all information about the camp including a schedule, login information and materials. Yes! It is packed full of great content and perfect for anyone wanting to finally “get their business in the cloud”.